We have begun the process of readying for the harsh upcoming Winter. In the higher elevations of Colorado (8,000 ft), temps can easily hit the negative teens-twenties (WITHOUT the wind-chill factor), so we are taking this VERY seriously. Our water heater is 10 years old, and you can tell. It’s just your typical 6-gallon, Suburban RV water heater. We get *maybe* a 5 minute warm/hot shower…before it runs out and we freeze to death. Also worth mentioning here, during my research, I learned that not ALL water heaters are meant to withstand such cold temperatures. You need to do extra winterizing to keep them protected from the elements. Thusly, they are NOT 4-season water heaters. Neither of us were sold on the idea of doing a 6-gallon, direct replacement for $500+. That would only buy us a couple extra minutes of shower time, at best. But, it would still cost a decent chunk of money…especially because we would have to spend MORE money on protecting it for Winter. We didn’t have the room to upgrade to a 10 or 12-gallon water heater, either. There had to be a better way. After several months of researching water heaters, I stumbled upon TANKLESS water heaters. But, not all tankless water heaters are rated to handle 4-seasons. Also, it is incredibly important to note here, that most people that install tankless water heaters into/onto their RV’s, are utilizing tankless water heaters meant for HOUSES…NOT RV’s. There are potential risks involved with that, and they are not recommended for Recreational Vehicle use. Several different 3-season models are currently available on the market. Most have decent ratings and reviews, although some are terrifying! A few are REALLY good…if you are a snowbird and head South for Winter. But only ONE is rated for 4-seasons, actual RV use, AND had fantastic reviews. It was a no brainer at that point. We decided to purchase the Precision Temp RV-550 Tankless Water Heater. It is the wall-vented/white model, since we were replacing a water heater in the side of our RV. Other models include: floor-vented unit and a marine-grade unit (for boats). It came with instructions, which are also available on their website, should you like to check them out beforehand. We actually DID do that, as we wanted to double-check measurements and installation procedures, before jumping into that expense. We realized that we would most likely need to cut the hole in the side of our RV slightly larger, as these tankless units are fitted to be direct replacements for 10-gallon water heaters…not 6 gallons. That wasn’t going to stop us, however, and would be well worth the modifications. The installation instructions looked easy enough. Attach gas line, plug in the hot and cold water lines and hook up to electric. Done, done, and done. I ordered it immediately. (Ordering info at end of post.) In about a week, the FedEx man slid our newest project into my kitchen. And a week later, Nic was hard at work, ripping the old water heater out, and putting the new one in. THAT, was one hell of a joyous and long-awaited day! MAKE SURE TO DISCONNECT YOUR GAS AND ELECTRICITY AND TURN OFF YOUR WATER BEFORE PROCEEDING!!! And then it was finally time to install the tankless water heater!!! We have suffered through 5 minute, then freezing cold showers for nearly 3 years now. We are sooooo ready for this! My Husband requested I leave out photos of him hooking up the water, electric, and gas on the unit…just in case someone were to copy him, get it wrong, mess themselves up, and try to blame us. C.Y.B. It REALLY wasn’t hard though. And their installation instructions were VERY easy to follow (check them out on their website below, or HERE). After reading them, I could’ve installed it myself. Honestly. A quick note, however, be sure to pay close attention to what each wire on the old water heater does, that way, when you go to hook up the new water heater, you can match the wires. The new one used different colors than what the old one used. …AND IN WITH THE NEW!!! Marking the lines where he needs to cut to expand our hole the water heater will slide into. Scraping off the old putty, so it doesn’t mess with the saw. Cutting the hole wider. I had to reach in mere mm’s from the end of that blade, to hold the water lines back and out of the way. That’s trust folks. And love (or stupidity). Who knows. I had to go back inside, to hold the hoses and wires out of the way as he slid it in place. And then we had a slight setback…it didn’t fit right away. As it turns out, the unit is tapered, front to back. The front is taller than the back. So, should you need to cut your hole larger as well, make sure to save yourself some time, and measure it at the front, not the back of the unit (not the faceplate). That way, you can make the cut one time, not twice, then be done with all that jazz. He placed gummy tape all around the edges of the cut out hole, so that once the water heater was slid into place, it would create a great seal. He then caulked around the edges with silicone, to finish sealing it off. This is officially the prettiest thing on the outside of our RV now, haha! All white and shiny and new. Inside, he finished hooking everything up. He DID have to buy a couple extra fittings and hose line from Home Depot to get the lines to reach. The old water lines didn’t line up to the incoming water connections on the new water heater. That was still cheap and easy to do, however. The second we turned the power, gas and water back on, we turned on the shower and OH MY GOODNESS!!! WE OFFICIALLY HAVE NEVER-ENDING (as long as we have propane) HOT WATER!!! I let him have the first shower. He earned it. Love that handy man of mine. 20 Minutes later, he turned off the shower water and emerged with the biggest grin on his face. One less complaint with the RV (not that we have many to begin with). Now, we officially have more hot water than most people’s HOUSES. I am typing this post nearly a month after installation. Our propane usage has actually gone DOWN…DRASTICALLY. Almost by half. We originally thought we would be using MORE propane to operate this, but in reality, we only use propane when we need hot water (or the furnace, or the stovetop). It is a nice contrast to running propane constantly, to keep the water in the old water heater hot all the time. I guess that’s why they say it’s more energy-efficient. “The cold weather protection on the 550 series is standard. This feature will prevent freezing under most conditions. It has a built-in thermostat that turns the burner on in low burn when the heat exchanger temperature is about 38° F. At the same time, small 12 volt heaters protect the internal plumbing and control valve. It is currently 14 degrees outside as I type this on November 7th. Before I fired up this computer, I reveled in a 30 minute, scalding hot shower, without any issues. I am in love folks. In love with my tankless water heater (and the beautiful man that installed it), haha!!! I do not get paid for affiliated links. I don’t get paid for diddly-squat, lol, so please don’t think I’m getting something out of you buying this. We just REALLY LOVE THIS WATER HEATER, and thought you guys would love it, too! If you would like to check it out for yourself, you can see it HERE. Oh, and it comes with a 2 year warranty-assuming it isn’t your fault that it gets broken. If you would like to order it online for $1,125, they will redirect you to THIS site. Shipping to the lower 48 U.S. states is free. Thanks, as always, for following along with us, as we dove into yet another RV remodeling project. This will be our FIRST Winter (believe it or not) wintering in a COLD location. Our baby is due very soon, and we have zero intentions of leaving my fabulous Midwife that lives just down the street. 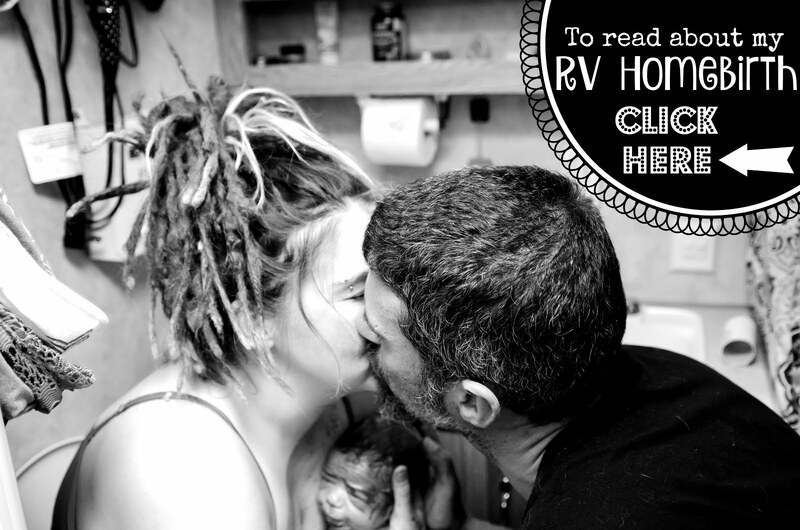 We are planning for another home waterbirth…but this one will be our first in the RV. This is another reason we are thrilled to have this endless water heater. Filling a tub, large enough to birth in, would’ve been impossible with our old water heater. Stay tuned for more! I will soon post about how we readied our RV for Winter in other ways! There’s more to come, and I can’t wait to share it with all of you!